Classic Park in Eastlake, Ohio is quite large for a single A team, and after attending a game there, it is obvious that the Lake County Captains, who play in that park, enjoy more support from their parent team, the nearby Cleveland Indians, than most other single A teams. It has a seating capacity of nearly 7,300 and a natural grass field. Very nice. Given the name of the team, it is not surprising that the park bears a nautical theme. The suites are dubbed the “Officers Club” and the toilets are on the Poop Deck. I could go on, but you get the idea. 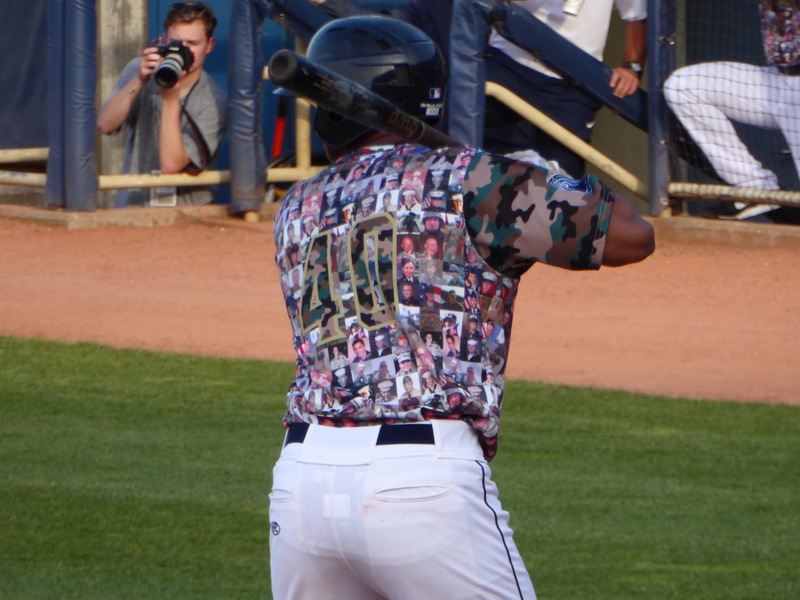 To add to the ambience (this was “Heros Weekend”), the team wore jerseys covered in pictures of folks from the area who have served or are serving in the military. From even a short distance, they looked like camouflage outfits. Then, to top it off, they had two “parades” before the game started. The first was graduates of a special reading program – there were three little kids. 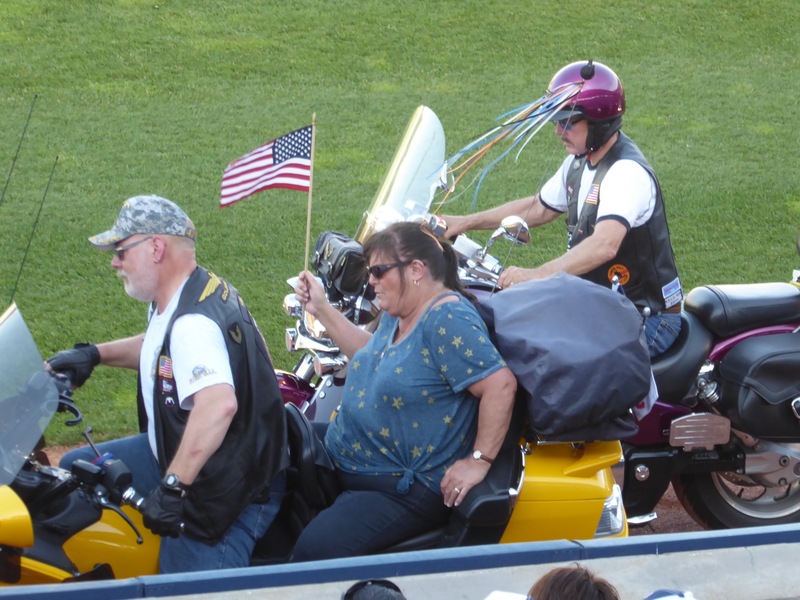 But the real attraction was about 60 motorcycles, many bearing hefty operators wearing leather vests, who rode around the warning track, parked in front of the dugouts and behind home plate, and. milled around until leaving just before the game started. Not sure how bikers and soldiers (and readers!) end up in the same show, but there you go. 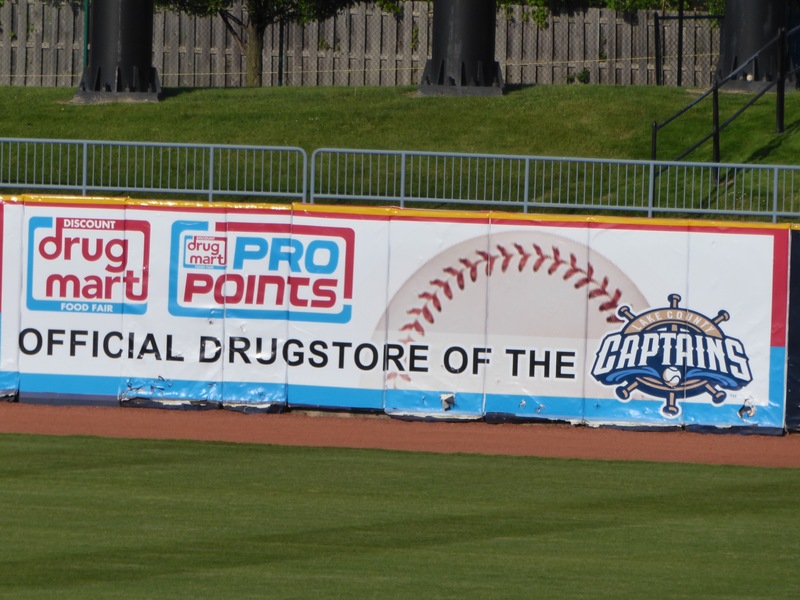 On this very pleasant evening, the Captains hosted the Bowling Green Hot Rods, but it wasn’t much of a contest. The Captains’ hitting and defense were both superior, leading to a lopsided victory. There was a good variety of food on offer at quite reasonable prices. A regular hot dog was $3.50 and my bratwurst (with onions and peppers) was just $6. Plus, they not only had the usual condiments, but some specialty mustards and, believe it or not, my favorite – Frank’s hot sauce. In the fourth inning, a sharply hit foul ball found a not sufficiently alert fan and she was carried out on a stretcher after about a 20 minute game delay. A reminder of the dangers of the game. Finally, I am back in the minors and thus have increased the chances of some strange outfield ads. This one struck me, given the not-too-distant history of the game, as wildly inappropriate. What sort of drugs? Approved by MLB? Really?